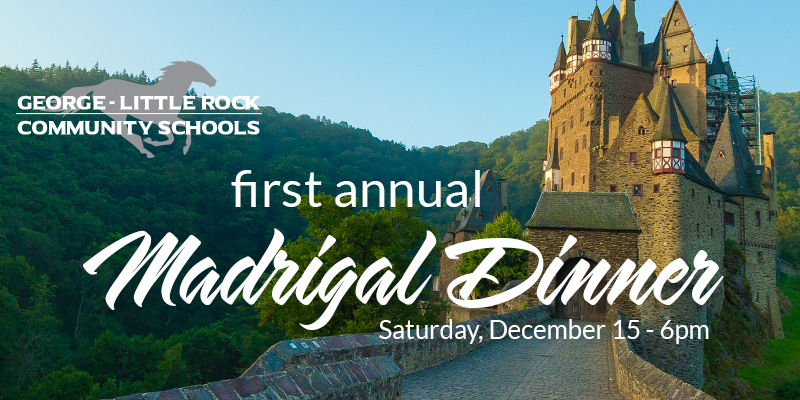 Enjoy a catered meal, along with musical and theatrical entertainment! If you would like to attend the 2018 Madrigal Dinner, the button below will take you to the sign-up form. The dinner will be held on Saturday, Dec. 15, at 6 p.m. at the George-Little Rock High School. Tickets are $25 (paid in advance) if ordered prior to Nov. 30 and the price will go up to $30 from Dec. 1 until Dec 10 (no tickets can be ordered after Dec. 10). If ordering after Nov. 30, you will need to pay at the time you make your reservation. Free babysitting will be available for younger children.